This caesar drink is a classic recipe with a simple but delicious twist. Once you try it, you will never have a caesar cocktail any other way. It’s made with vodka, savory clamato juice, a few dashes of worcestershire, a few more dashes of tabasco sauce, a good squeeze of lime, and our secret pickled ingredient. 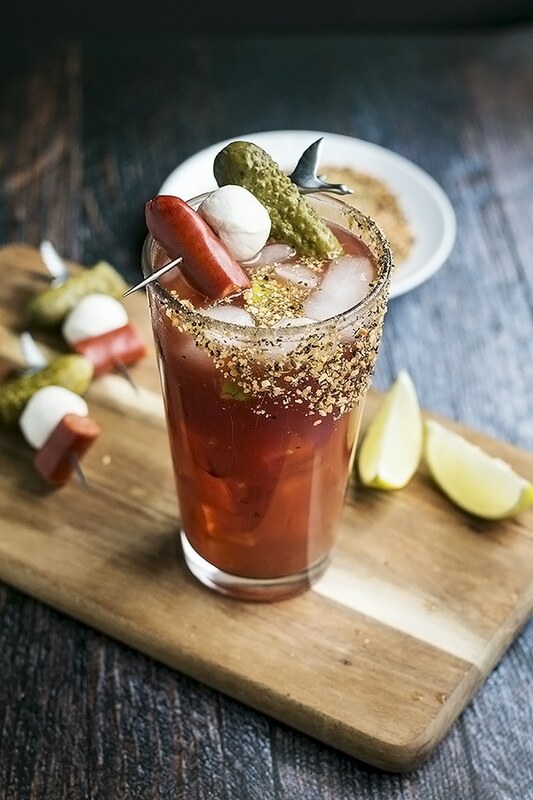 Among our family, friends and most Canadians, the caesar drink is a staple! This cocktail is often consumed on camping trips, a weekend lunch, or brunch on the patio. They are especially good the morning after getting a little too carried away, if you know what I mean… Plus, this caesar recipe is the best caesar cocktail around. In my opinion, of course… lol. So with caeser cocktails being so big in our family, my younger sister Sam and my daughter Jessica both wanted to learn how to make the famous concoction. So we taught them, Debbie and I both thinking, “Great! Now we dont have to make them!” However, as the years have passed, I have heard the two of them say, “I make the best Caesar” many times which is funny to the rest of us because one, ummm…, who taught you how to make those caesar’s? And two, you don’t even drink them so how do you know?! But hey, if that’s what it takes to get a drink made for me then yup, you definitely make the best caesar. Ill take two! And to be truthful, both of them make the best caesars ever! 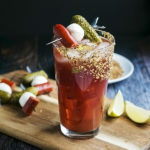 Is the Caesar Cocktail a Canadian Drink? Yes! The cocktail was created in 1969 by restaurant manager Walter Chell of the Calgary Inn. The cocktail was added to the menu and was a huge hit. 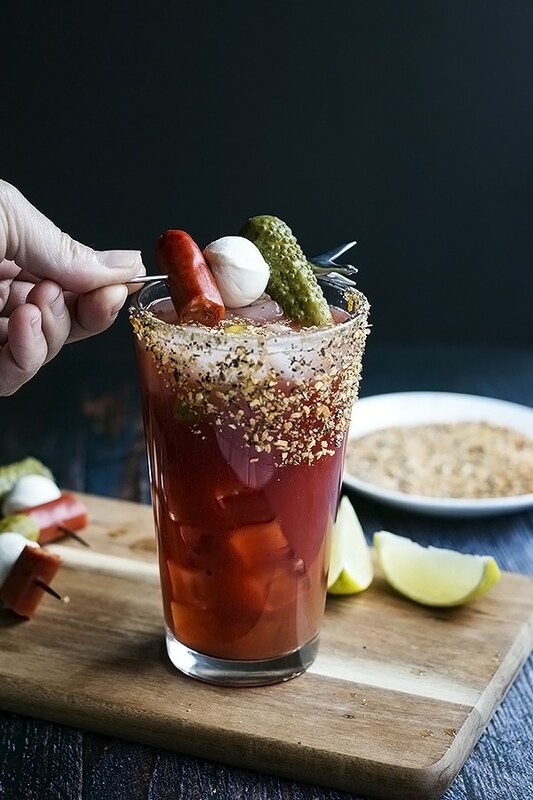 It quickly became a popular drink within Canada and now more than 350 million caesars are consumed annually! In Canada, its hard to find a restaurant without a version of the caesar drink on its menu, but surprisingly (to us Canadians) it can be pretty tough to find in other countries. Even in the US, our closest neighbor. Ordering one outside of Canada often gets you a confused look. 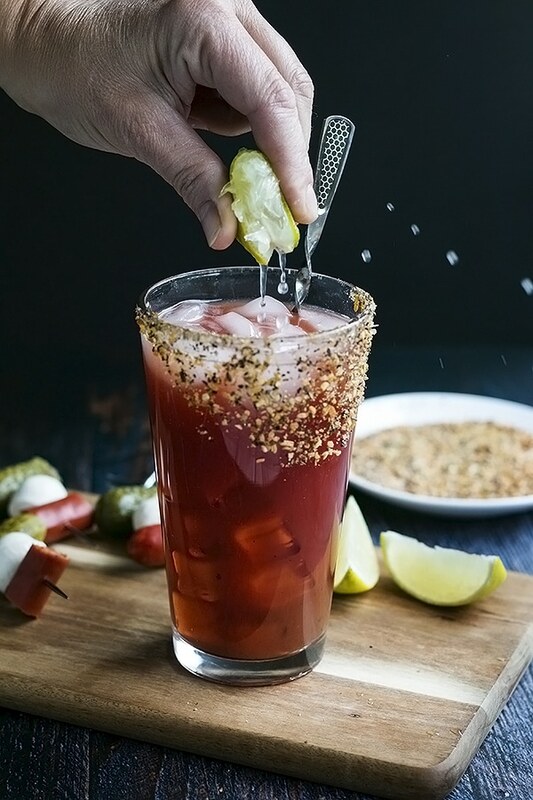 We Canadians can get pretty obsessive about our caesars. True story: I met some other Canadian girls while traveling in Thailand and they had brought a few bottles of precious clamato juice with them on their backpacking trek and they generously shared one with me one morning at a beachfront pub. How very Canadian of them, eh?! 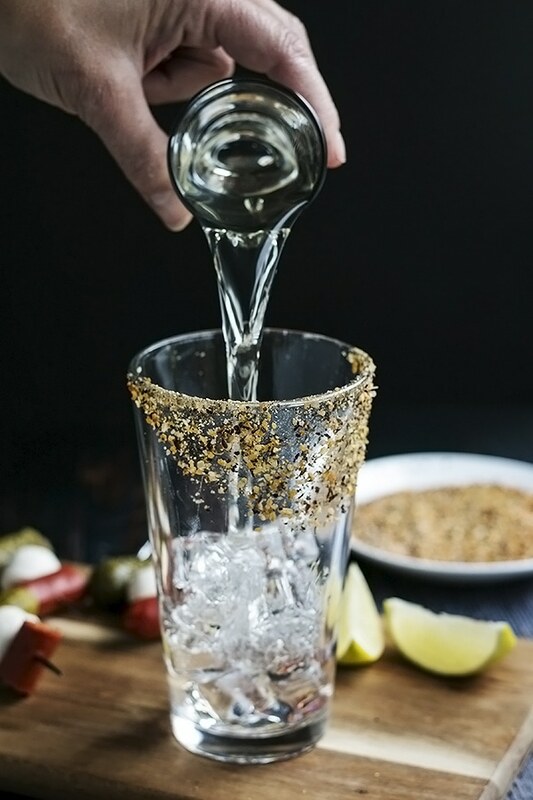 The secret ingredient in our caesar drink recipe is… Pickle Juice! Yup, that’s it. I know for some people it sounds very weird and I sometimes get a funny look when I order a side of pickle juice with my caesar at a restaurant. But those of you who have tried it, you know what I’m talking about. I can’t drink my caesar without it now. And actually, if you have spicy bean juice handy, that works just as well or better yet, throw in a little of both! If that wasn’t enough of a twist for you, we recently made our own savory infused vodkas that made our caesar cocktail pretty incredible, if I do say so myself. You must check them out! Clamato juice is basically tomato juice, clam nectar (or clam juice…) and some sugar. It’s what differentiates the Caesar drink from a bloody mary cocktail. For the LONGEST time, Mott’s has been the primary producer of commercially produced Clamato juice, however lately I have seen a couple other’s pop up with other options. The most famous one so far is Walter’s which is an all-natural version that we love. 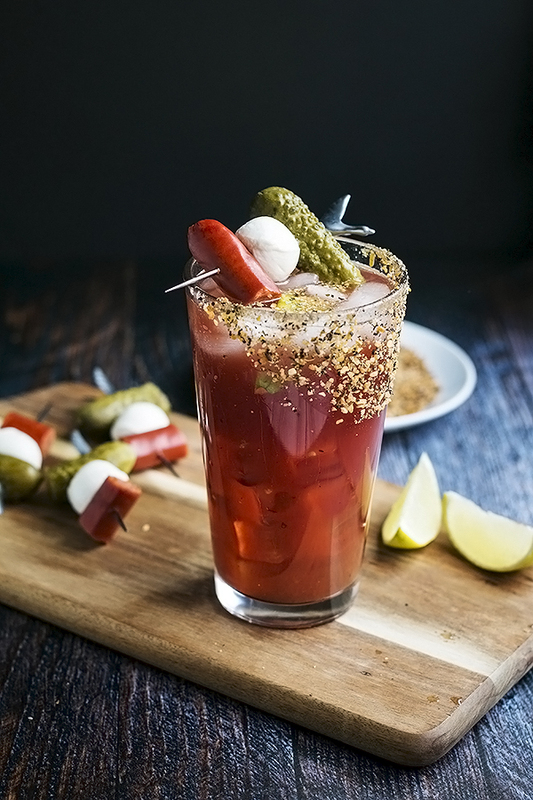 The biggest difference between the Caesar cocktail and the Bloody Mary cocktail is that Caesars use Clamato and Bloody Mary’s use tomato juice. That’s it. And while Ive never been a Bloody Mary drinker, I have to say that I have seen WAY more variations on the Caesar and also with the toppings than I have with the Bloody Mary. First rim your glass: take a lime wedge and run it around the top rim of your glass, then dunk the rim in whatever you are using to rim your glass (see below). Fill the glass with ice. Pour in the vodka and the pickle juice. Squeeze in some lime juice ( I like at least 2 wedges, but I usually have a bit more. I like it limy!). Fill the glass with clamato juice. Add worcestershire, tabasco and sprinkle some montreal steak spice in, or you can use garlic plus, or lemon pepper… whatever you like. Give it a good stir. Garnish with pickles, cheese, pepperoni or spicy beans, or olives or whatever tickles your fancy! How do You Make a Caesar Rim? 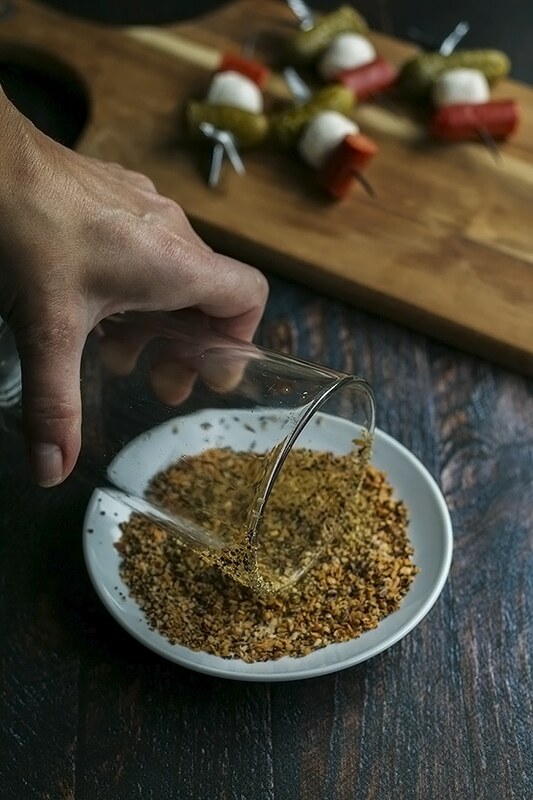 make your own spicy salt with salt and chili pepper! Do you have other things you use to rim savory drinks? Please tell us! If you’ve tried this caesar drink recipe then don’t forget to rate the recipe and let us know how it turned out in the comments below. We love hearing from you! A caesar cocktail with vodka, calmato juice, a dash worcestershire, a dash tabasco sauce, a squeeze of lime, and our secret pickled ingredient. Pickles! 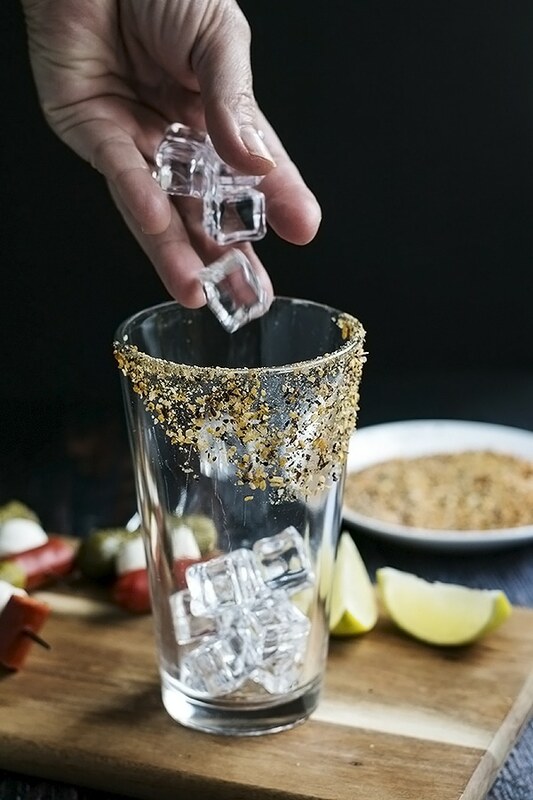 Take a lime wedge and run it around the top rim of your glass, then dunk the rim in the celery salt or montreal steak spice. Fill the glass with ice. Pour in the vodka and the pickle juice. Squeeze in some lime juice ( I like at least 2 wedges, but I usually have a bit more. I like it limy). Fill the glass with clamato juice. Add the worcestershire and tabasco and sprinkle some montreal steak spice in, or you can use garlic plus, or lemon pepper... whatever you like. Give it a good stir. Garnish with pickles, cheese, pepperoni or spicy beans, or olives or whatever you like. This sounds amazing! But I have a “from a Southern US state” question…what kind of pickle juice do you prefer? Is it a dill pickle juice or a sweet pickle juice? I love the idea of adding spicy bean juice so I am guessing its NOT a sweet pickle juice but let me know anyway please. 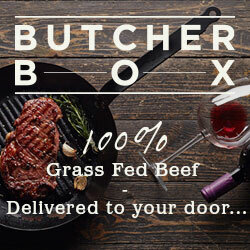 Have you tried pickled okra in this? That really might be just a southern thing but they are wonderful in Bloody Mary’s and I am guessing they will be yummy in this too. Love this comment 🙂 Yes, dill pickle juice. I have not tried pickled okra! ever! but I would love to and I bet it would taste amazing as well. Loving the blog, thanks for all the wonderful ideas! For an even tastier Caesar I like to add a garlic clove… I dare you! The juice is a great add, which is why I usually have dill gherkins in mine, but I also switched from vodka to gin. The juniper in the gin really compliments the clamato (I also prefer Walters) in a way that vodka can never really match. I have NEVER tried a gin caesar! I will have to give it a try. I also like Walters! Its hit or miss with some people though. Can I use strubs pickle juice? Sure you can. Any pickle juice works.